This study examines whether improvements in probability and cost biases following cognitive behavioral therapy for social anxiety disorder endure over the long-term. Participants (N = 65) diagnosed with social anxiety disorder were randomly assigned and completed eight sessions of either exposure group therapy or virtual reality exposure therapy delivered according to a treatment manual. 24 participants completed standardized self-report measures of probability and cost biases at pre-treatment, post-treatment, and 5½ years, on average, after completing active treatment (range 2.5–6.5 years). Analyses of variance show that, relative to wait list, participants who completed an active treatment reported greater decline in probability and cost biases at post-treatment. Further, relative to pre-treatment, all treated participants reported significant improvements in probability and cost biases at post-treatment and at long-term follow-up. 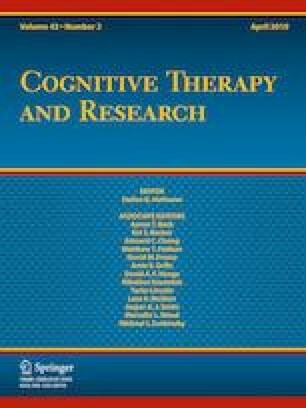 Cognitive-behavioral therapy may lead to long-lasting reductions in cognitive biases. This study was funded by the National Institute of Health (R42 MH 60506-02), awarded to Page L Anderson. Amanda A Benbow has received funding from the Brains and Behavior Fellowship. Amanda A Benbow and Page L Anderson declare that they have no conflict of interest.